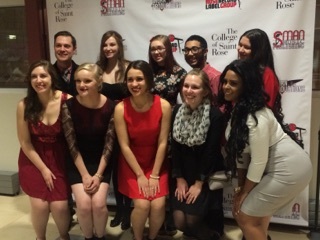 Last Friday, February 13, the Rose Record Label Group made its stellar public debut! 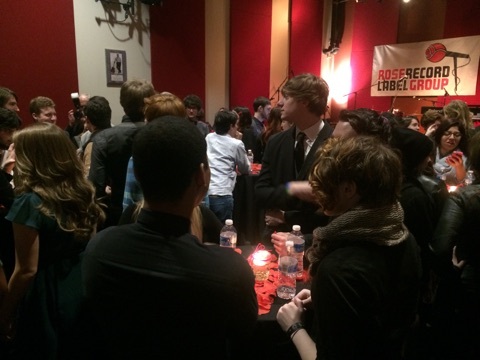 This semi-formal event packed Jack’s Place full of all kinds of people from the Saint Rose community who wanted to see what our music industry students had accomplished. Everyone was dressed for the occasion, even the building! I had never seen the Hearst Center look as great as it did that night! Everything was set up beautifully for the night. Music recorded by the new label was playing while everyone met and mingled, discussing the Group. A computer was made available for guests to view the website and there were live performances throughout the night by signed artists Matt Dalton, Ryan Leddick, and Immaculate Heart, who also released their first music video! However, the most important part of the evening was to talk about the behind-the-scenes work that this new student endeavor had begun to take on. Several student executives in charge of the project, including Stacia Burns (President of Rose Record Label Group), Ellie Decker (Vice President of A&R), Amelia Rossettie (Vice President of SMAN Music Publishing) and others, all had time on stage to explain the work each branch of the Group had been doing. The Group is made of three parts: Rose Record Label, SMAN Music Publishing, and Thorn Productions. Each branch handles some of the many different responsibilities of the Group just as they would in any other company in the music industry, as this is a fully functional and professional business operated by students! How awesome is that?! There was no doubt in anyone’s mind that this group of students meant business! The guests were all filled in on what has been done and some of what is to come. I left that night feeling so excited for everything my fellow students have accomplished, and I’m only more excited for what they have in store. Congratulations on a strong start and a bright future Rose Record Label Group!